The University of Ulster is breaking new ground at Magee with an innovative degree that gives graduates a vital first step to careers as qualified accountants with specialist expertise in managerial finance. Accountancy governing body, Chartered Accountants Ireland, has signalled its support for the full-time course which combines accounting and managerial finance and starts in September. The new accounting programme in the North West marks a major expansion of professional and business education provision at Magee. It is expected to boost prospects for business development in the North West. New degrees in management information systems and creative advertising technologies are being planned for next year. The new BSc Honours Accounting and Managerial Finance is an important step forward in the University’s plan for radical expansion at Magee. A development plan unveiled last year envisaged the campus doubling in size, with more courses, new infrastructure, an additional two research institutes and a bigger student population. The strategic plan identified a demand for more professional and business services education. 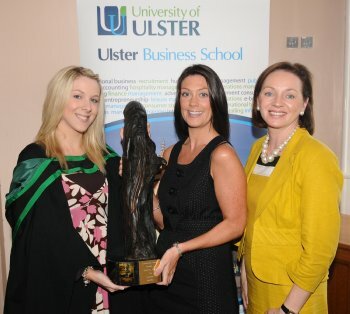 The Department is part of the Ulster Business School, the University’s internationally respected think tank which recently expanded its courses at Magee with a Master of Business Studies course that has attracted students from abroad. Professor O’Reilly gave details of the new degree at an awards ceremony for high-achieving students in her Department. Professor Deirdre Heenan, Dean of Academic Development, said: “The new degree adds further prestige to the campus and city. It is an exciting time for Magee and I congratulate the dedicated team who have brought this innovative course through from initial concept to final validation. A team of academics and key figures in North West financial services has worked intensively over the past year on the design and skills content of the new degree. Professor O’Reilly praised “the pivotal role” of Mr Gerry Murray, one of Northern Ireland’s most respected chartered accountants and economic analysts. Mr Murray is a partner in the Londonderry chartered accountants’ firm, McDaid, McCullough, Moore, which is one of the North-West’s biggest accountancy practices. The initiative comes in the wake of other recent Magee firsts and progress in the University’s plans for the campus, including obtaining an option to expand on 30 acres of land at Northland Road which are owned at present by Foyle and Londonderry College. The first class of 30 trainee solicitors from the Graduate School of Professional Legal Education at Magee received their certificates at Magee’s recent summer graduation ceremonies. The institute is the sole provider of professional legal education in the North West. For the first time also, students will be able to take a degree in information and communication technologies at Magee and a degree in creative computing will also be launched. Next year the campus will host a Distinguished Fulbright Chair, one of just four UK institutions to receive the coveted US academic accolade.